This is the most thorough and complete presentation yet of how to follow the via pulchtritudinis, to teach others how to do it too and transform the culture in the process! Includes detailed material available for the first time which is not available anywhere else. A course for teachers, home-schoolers, parents, educators, artist, architects, those involved in the formation of adults at parish level... and anyone interested in seeing a culture of beauty. Endorsed by Thomas More College of Liberal Arts, Merrimack, NH. I am delighted to offer for the first time an online course in the Way of Beauty TM, SM for credit. It is my most thorough and deepest exploration yet of the theology and philosophy of the topics that I cover in my blog, much of it not seen anywhere else. Do you know, for example what makes an image worthy of veneration and for use in the liturgy? Did you know that icons are neither the only or the highest form of sacred art in the Catholic tradition and that the High Renaissance isn't appropriate at all? Do you know what Newman said is the most important feature of a successful educational institution? (Clue: it's not the curriculum, or the quality of the teachers or the teaching methods used.) Or what Pope Benedict says is the purpose of all Christian education, no matter what subject is taught? and through these we demonstrate the connection between our worship in the liturgy and the forms contemporary culture, in the broadest sense of the word, which incorporates all human activity. You will qualify for 25 hours continuing education, endorsed by Thomas More College of Liberal Arts. The cost is just $99. We have set this price so that it is within the budget of all. This course is a unique presentation of the Way of BeautyTM, SM- the via pulchritudis - that leads us to Beauty itself and is itself Beautiful. What is presented here is simultaneously traditional, and radical and revolutionary. Most of the written material provided was created especially for this course and not available in this detail or in such a coherent and integrated presentation anywhere else, not even my blog, my books or past articles. You do the study in your own time, at your own pace. To sign up follow the link here. To complete this and get the credit you simply have to: watch the 13 videos in a series entitled the Way of Beauty TM, SM, which has the beautiful production values of Catholic TV with whom we made the shows; and then read the material written exclusively for this course and which accompanies the videos; and finally you when have done this you tell us... and we send you the diploma. For those who wish to talk about the material there will be a chat room for participants, and anyone is free anytime to email me and ask questions. The hope is that this program will be extended to college level credit in the Fall. For high-school students or undergraduates looking to get transferable college level credit, we will require some additional reading and there will be quizzes and graded exams. For even more credit at either level, you will be able to combine it with the residential practical classes in painting supported by lectures that will appear in different locations around the country in the coming year. We have deliberately set this at a special low price. A course for teachers, homeschoolers, parents, educators, artist, architects and anyone interested in a beautiful culture: this material was originally developed as a formation for artists and as such it can help in the formation of anyone interested in the creation of beauty. At Thomas More College as we contemplated offering the course to undergraduates, we realized very quickly that this is in fact intrinsic any good education no matter what is taught - every single one of us would benefit from a formation in beauty for all good things can and ought to be done beautifully. It was integrated into the core undergraduate program in the liberal arts and has been taught for the past 5 years with great success both to undergraduates and in the residential summer schools, open to all, that take place at the college campus each year. So as well as artists, musicians and architects, it will be of interest to anyone interested in the formation of adults or children and anyone who is interested in developing a curriculum for a Catholic education, for example, home-schoolers, parents and teachers of any discipline. In the course I draw on a number of sources for this. First my experience over many years as an internationally known professional artist and experienced teacher of art using traditional methods, as well as my experience of the medieval structures of Oxford University. 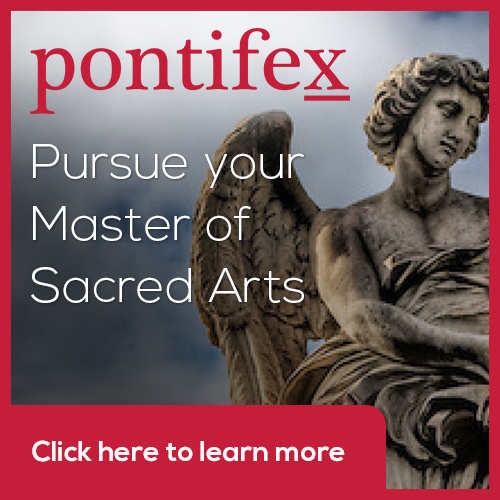 This course also reflects faithfully the traditions of the Church and draws upon the writings of Church Fathers, especially Augustine and Boethius; and more recent commentators on beauty, culture, liturgy and education such as Blessed JH Newman, St Pope John Paul II and most prominently Benedict XVI. It outlines a way of educating that is consistent with the Faith and is transmitted joyously. Cult and culture: how culture in general is derived from our worship and why it is the strongest influence on is in our formation and our education, bar none - not social factors, not economics, not politics. Catholic Education The course will explain how an education in beauty can be taught to people of any age and integrated with the education as a whole. It will also explain why every Catholic education, no matter what is taught, no matter how narrow or vocational, should be integrated with an education in beauty, for it will enable those so formed to do all things better. The Catholic traditions in figurative art with case studies on a number of paintings in each figurative tradition. You will know, for example, what makes the gothic, the baroque and the iconographic styles distinct; and what connects them so that each tradition is appropriate for the liturgy. We contrast and compare these with the forms of art that reflect modern philosophy and from traditional non-Christian cultures. The numerical basis of the patterns of beauty - how to order time and space according to traditional harmonious proportion. You will have a detailed account of the scriptural and cosmic sources for traditional ideas of proportion and harmony and understand how each reflects the patterns of the liturgy. This is most commonly associated with architectural proportion and music, but in fact has application in just about any aspect of human culture. You will learn why, for example, the Golden Section is not one of the traditional proportions of beauty, contrary to popular opinion. This will also include a description of traditional number symbolism and you will see how this was used to design traditional forms of art, both figurative and non-figurative patterned art. Creativity, Intuition and Love These are the fruits of a traditional education in beauty. It develops us as people so that we have more ideas and better ideas and can grasp the relationship between particulars and the whole in any context better. It also increases our capacity to love God and man and our inclination to do so. This is demonstrated not only by reference to the traditional understanding of these things, but also to modern scientific research which supports the points made. While this is presented as a discussion about these topics as subjects to learn, we provide guidance also to those who wish to become more creative, intuitive and loving by actually practicing and experiencing the principles described. The Way of BeautyTM, SM is a service mark and trade mark wholly owned by David Clayton and cannot be used by others except with his permission. Our chivalrous modern day Knight of the New Evangelization is my symbol of today's mission for the Church!